Really? Why would they do such a thing? Fluent in Spanish, Bush has credibility within the Hispanic community that could help broaden his coalition. He also has the gravitas many Republicans say is required to compete with former secretary of state Hillary Rodham Clinton, the Democrats' leading potential contender. 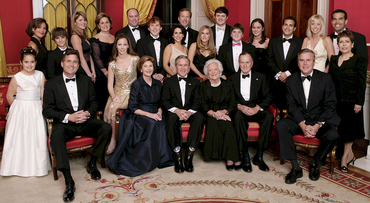 Bush/Clinton/Bush/Clinton now and forever, at least until George P Bush marries Chelsea Clinton and the two ruling houses are consolidated into one House of Bush-Clinton-Rodham-Coburg-Gotha. I've nothing against Jeb Bush. I happen to disagree with him on "immigration reform", but he was a competent executive of Florida and he's a thoughtful and (on his game) gifted speaker. But there are over 300 million people in this country, and, granted that 57 per cent or whatever it's up to by now are fine upstanding members of the Undocumented-American community, what is it about the Bush family that makes them so indispensable to the Republic as to supply three presidential candidates within a quarter-century? Say what you like about actual monarchy but at least you get a non-heriditary political class: this may seem incredible to Americans but neither Canada's Stephen Harper, Australia's Tony Abbott, New Zealand's John Key nor Britain's David Cameron is the previous Prime Minister's brother or wife. So who are these "influential Republicans" working to draft Jeb? Many if not most of 2012 GOP nominee Mitt Romney's major donors are reaching out to Bush and his confidants with phone calls, e-mails and invitations to meet, according to interviews with 30 senior Republicans. One bundler estimated that the "vast majority" of Romney's top 100 donors would back Bush in a competitive nomination fight. "He's the most desired candidate out there," said another bundler, Brian Ballard, who sat on the national finance committees for Romney in 2012 and John McCain in 2008. "Everybody that I know is excited about it." The guys who picked last season's loser are already excited about next season's loser. How exciting is that? ~Now that Jeb has been officially nominated to give the concession speech in November 2016, and John McCain has indicated he's so eager to pass "immigration reform" that, in a good-faith attempt to mollify his base, he's calling it the Edward M Kennedy Immigration Act, we should add "immigration" to the ever lengthening list of words whose plain meaning has been transformed by US public policy. At which point I stopped, and went back, and reread it. For it seemed to me at first glance that Mr DeParle was airily citing laundromats doubling as money-transfer stores, jobless men drinking and sleeping in the sun, and dysfunctional metropolitan government all as evidence of "the aura of Central America". And that can't be right, can it? Oh, my. When somewhere called "Langley Park" becomes for mysterious and unspecified reasons "two-thirds Latino and foreign-born", that's not immigration. But McCain & Co have appropriated the word in order to connect a transformation unprecedented in American history with the "nation of immigrants" myths to which sentimental types are so prone. If this vast demographic group are "undocumented immigrants", those of us who did things the legal way are documented but un-immigrants - that's to say, we're not what comes to mind when "immigration" and "reform" are under discussion. Mark Krikorian notes that the Obama Administration is not so subtly suspending the immigration laws of the nation. True, but only for favored groups. The more lavishly the undocumented are exempted from the laws, the more zealously the bureaucracy will hound Japanese businessmen and Slovenian spouses for concocted infractions. A friend of mine was detained on landing at Dulles last year. A Green Card holder, he'd spent more than six months out of the country. Which is not illegal, incidentally. The reason he was overseas? He'd been working for the US Government. But that reason's not good enough for the same US Government's immigration bureaucracy. So he now gets hauled aside whenever he returns to the country. A man of unique talents, he will eventually weary of this treatment and take his skills elsewhere. But John McCain will get his 30 million pool boys. This didn't happen in the Middle East. It happened in Sydney. Hassan stabbed her at least 14 times then called triple-0 and told the operator "There's a problem with my wife". It's the culturally diverse version of Henny Youngman: Take my wife. Please. ~The IPCC's latest give-us-all-the-money-and-power-or-the-world-will-end report is released today. I'll be combing through it, if only for its implications for the upcoming Mann vs Steyn trial of the century.